It’s simply fun to travel with children – to see their evolution and how their perception of the world and their surroundings change as they grow. It also applies to their taste – fortunately. For granted, it has sometimes been a challenge to have two children, where one (at least tries) to eat and taste the most and where the other at times is reasonably picky and skeptical to try new things. It is not easy to combine 2 kitchens, which in our case are Danish / Turkish (and from all over the world, for both my husband and I are “foodies” who are quickly inspired and love to taste and cook food from most countries). As now, when we last stayed at grandfather. There is no doubt, that you always eat good at grandfathers, and we are often enriched with sumptuous meals combined with the more simple and traditional cuisine. It’s always a great inspiration to get down there andsometimes refresh a dish or two. 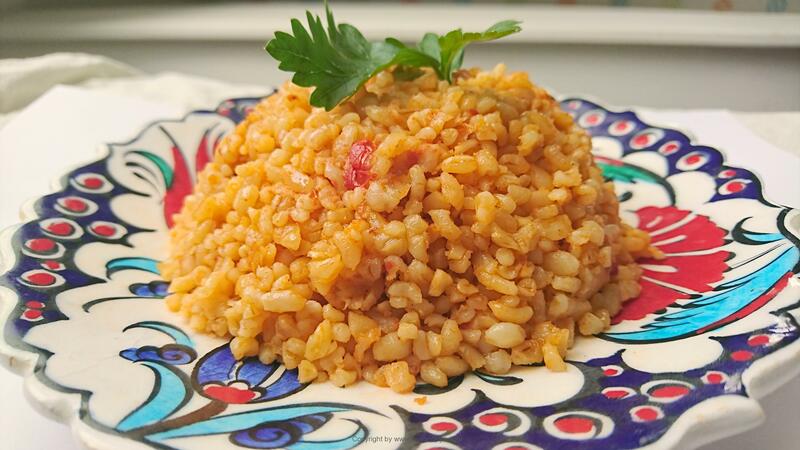 It is an indispensable rule that we always get Domatesli Bulgur Pilavi – Bulgur pilav with tomatoes. It simply tastes so great and grandfather is a master to make it. 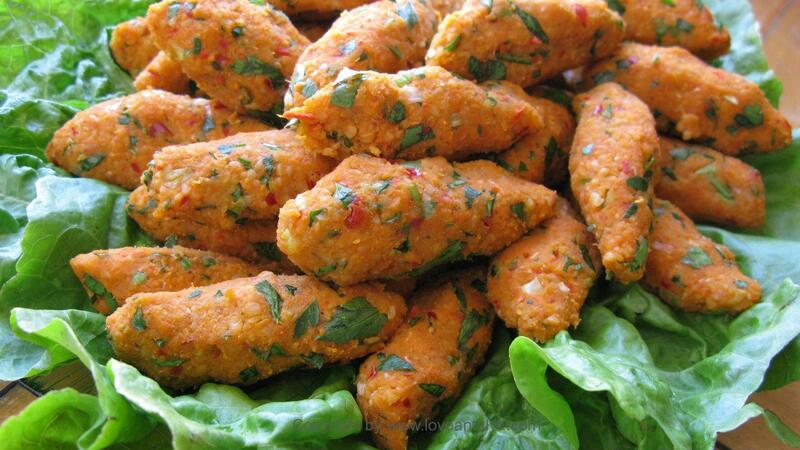 Bulgur pilav is used for a variety of dishes and is a welcome replacement for rice, which is usually presented to most meals (which I often get a little tired of). 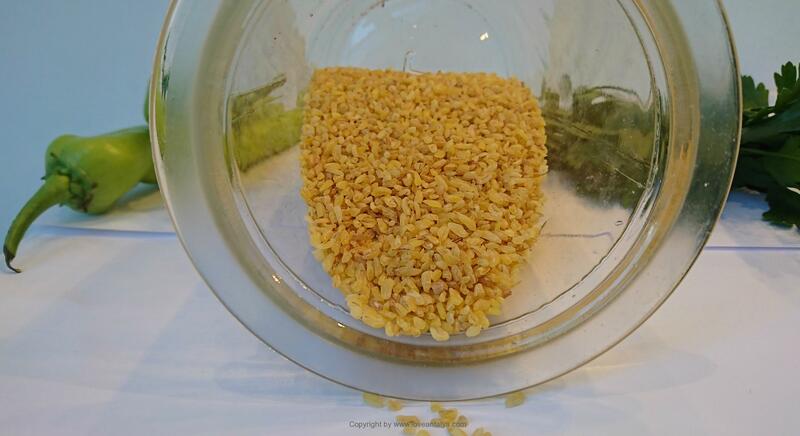 I’m sure you know very well about bulgur if you follow this blog – it’s certainly not my 1st recipe with some kind of bulgur 😉 and then these decisious broken wheat kernels are normally used a great deal in Turkish cooking. Bulgur is also super healthy and has a better nutritional value and a lower calorie content than rice. And then they are really satiating. Bulgur is available in several different versions, with the distinction between rough or fine. 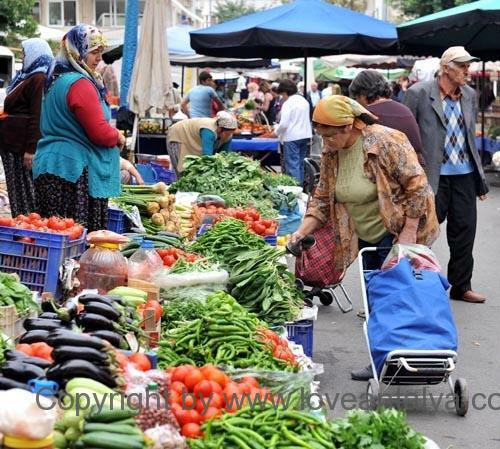 A trip to the local bazaar right this season is enough to make your head spin (if you want to visit our (yes think .. 🙂) local bazaar, you can read more about it here). The fresh wheat kernels are transported into large nylon bags from the hinterland and sold at kilo-price. Just the smell is simply amazing !! You can of course also choose to buy your bulgur in the well-known packagings in supermarkets, but there is a taste difference (I imagine) whether they are fresh or not. Well, but back to those children, the fun is, that we each time (at some point) while we are with grandfather and often also at different restaurants are served Bulgur Pilav in one form or another. We certainly do not have a vacation, where we don’t get it at least 4-5 times. And sometimes i make it at home aswell. So one should think our kids would be used to eat bulgur pilav by know. But it apparently passed my youngest (11 years) by. For suddenly this year he was completely obsessed with bulgur pilav and was almost asked grandfather to make it every day. So here you have grandfather recipe for bulgur pilav with tomatoes. 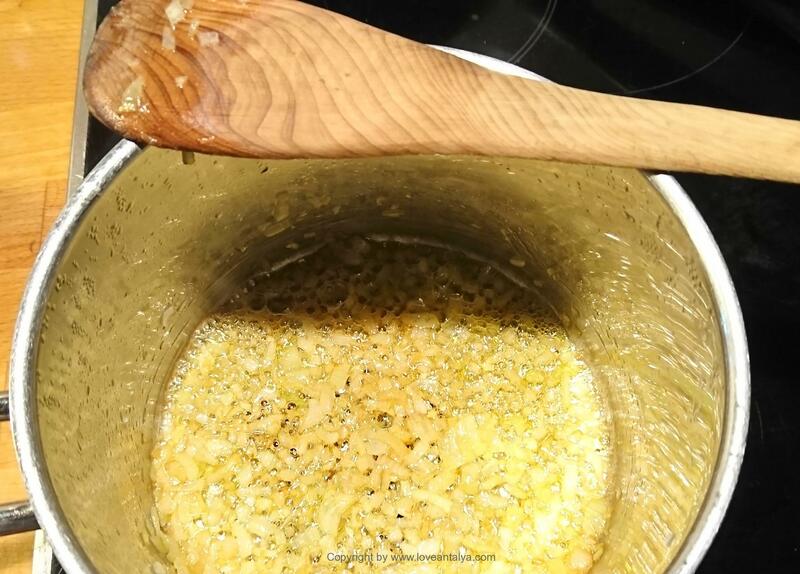 It is similar to most other bulgur recipes, but after his device, you have to use quite a lot butter (and, that makes a difference I must say). This dish has to be a little bit greasy – just so it does not get too dry. 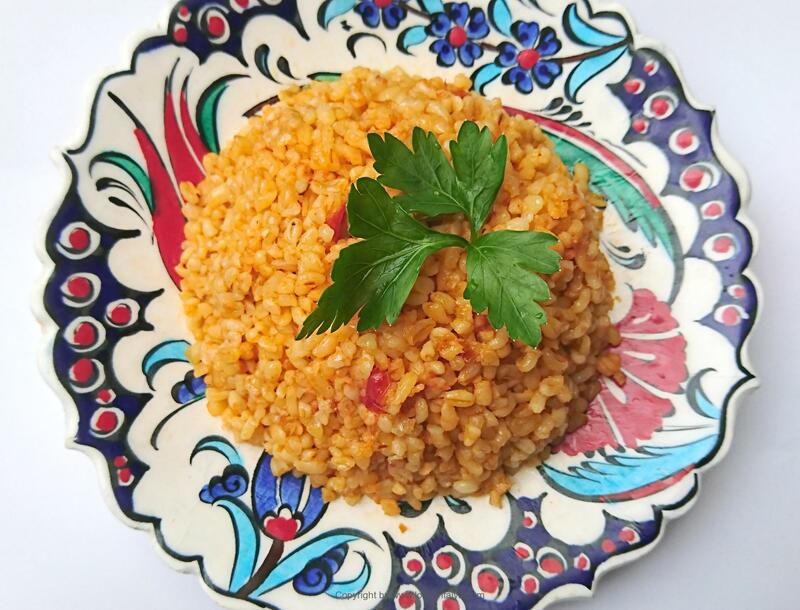 Domatesli Bulgur Pilavi – always contains tomatoes, a single green pepper and of course bulgur. And then enough amounts of butter (ok, maybe I do not use 100 grams as my dear father-in-law uses, but at least half). 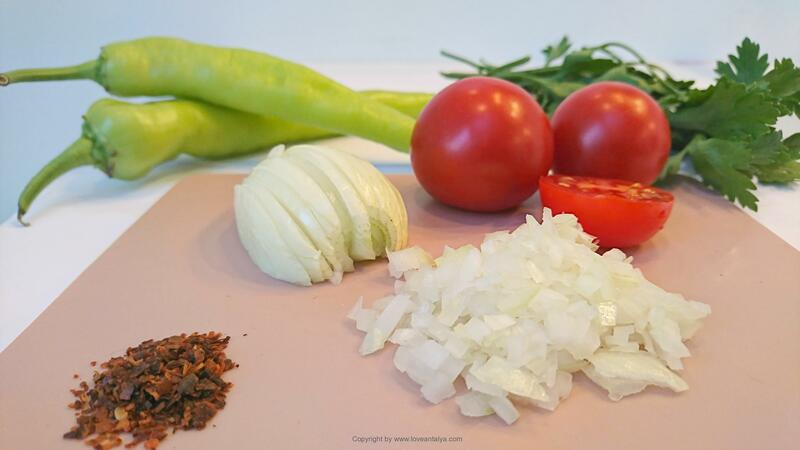 The bulgur must be the rough kind – pilavlik bulgur. It has some coarser grains – a bit like rice, according to the finer bulgur – Ince Bulgur, which I often use in other dishes such as the fantastic bulgur salad Kisir or the beautiful Mercimekli köfte. We often make a large portion of this bulgur with tomatoes, because we then have a little extra for lunch on the day after, for lunch packages or for dinner. The beauty of the different bulgur recipes is, that they are staying fine for a couple of days in the fridge and actually just tastes even better the next day. 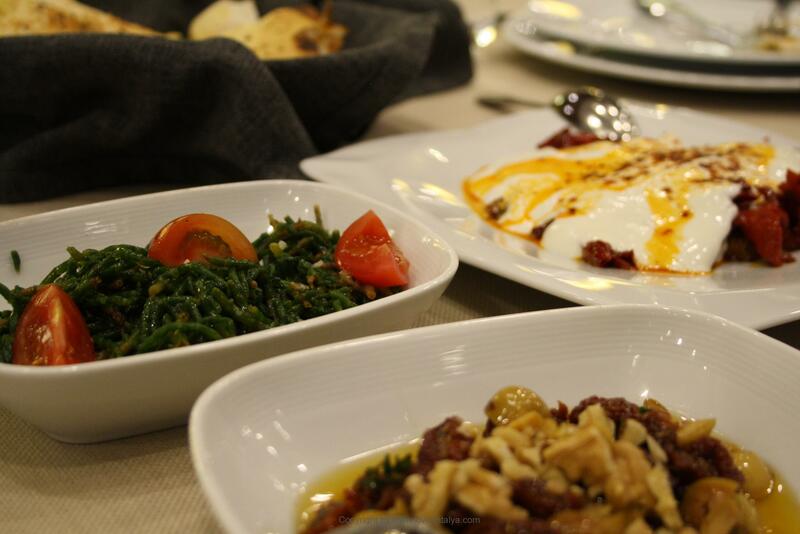 And then bulgur is very easy to cook in the very right Turkish way – just follow here. 5: Turn off the fire after approx. 15 minutes, but let the bulgur stand on the hob - with a lid on- for another 15 minutes. Then it's ready for serving.